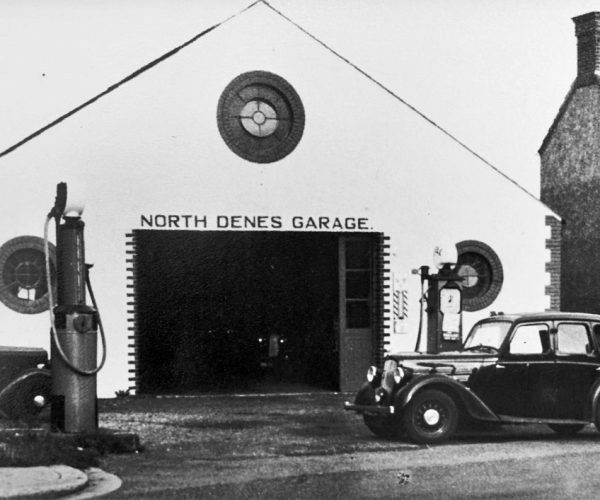 North Denes Garage was originally opened as a vehicle storage facility at number 1, Sandringham Avenue, Great Yarmouth in the early 1900’s by Leonard Morris the Grandfather of Robert the current owner who is indeed now himself a Grandfather. The Morris family have great pride in being one of the oldest established businesses in Great Yarmouth and will soon have provided motoring services to their large customer base for 100 years. In 1923 petrol pumps were added to the business and on July 23rd, 1923 the first delivery of petrol was made and is used by the family as a start date although the business is slightly older. 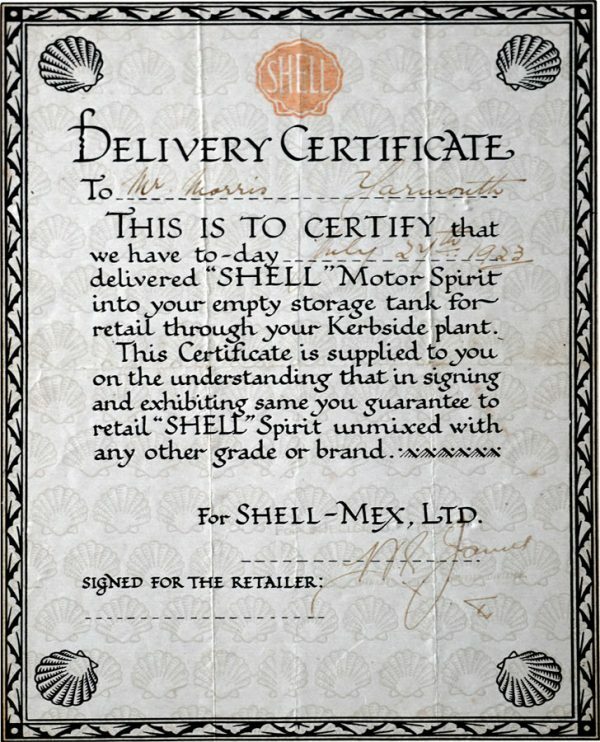 The certificate shown from Shell is dated and signed by the Shell representative but Leonard Morris did not sign the certificate as “his word was his bond” if he shook hands on a deal that was that, and the family have kept to that philosophy throughout and is why many customers return time and time again, for good old fashioned honest service and value. The Garage was used as a storage facility for many years with Leonard Morris carrying out repairs and general engineering work along with general dealing and the buying and selling of motor vehicles. During the Second World War, the garage was used as an Ambulance Station and Mrs Eva Morris (Leonard’s Wife) was one of the Ambulance drivers. After the War Leonard was joined by his two sons Sydney and Bob who further enhanced their father’s skills and began to grow and expand the business, keeping pace with the massive technological advances that we have seen with the motor trade over the years. The garage became an MOT Testing Station when the Government of the day made it a requirement for vehicles to be tested and remains a testing station to this day. In the 1960’s the Garage was appointed as an agent for Standard Triumph and started to sell new vehicles as well as used. This continued until 1972 when with a poor supply of vehicles and spare parts mainly due to the national strikes, Triumph was relinquished and the Datsun franchise was taken in its place. This was short lived and in 1974 the garage was appointed Skoda Main Agent for the Great Yarmouth area, this working relationship continued for over 30 years and saw the business win many awards for both Vehicle Sales and After-sales. Robert worked in the business from a very early age and was “taught the family way of business” by both his father and uncle, uncle Sid retired in 1984 and shortly after this Bob took semi-retirement due to ill health leaving Robert with the day to day running of the business although Bob took a keen interest in the business until his death in 2013 aged 88. Lorraine, Roberts wife joined the firm in 1990 to assist with the general running and managing of the business and continues to work alongside her husband today and is a mine of information for customers to contact on all matters regarding vehicle repairs and servicing. In 2001 the garage closed the Petrol Station allowing the expansion of the used vehicle forecourt, and this was further enhanced in 2014 / 2015 when further work was carried out to allow an even greater number of vehicles to be displayed. The business continues to evolve and develop to keep pace with the ever-changing and ever more complicated modern motor vehicle. 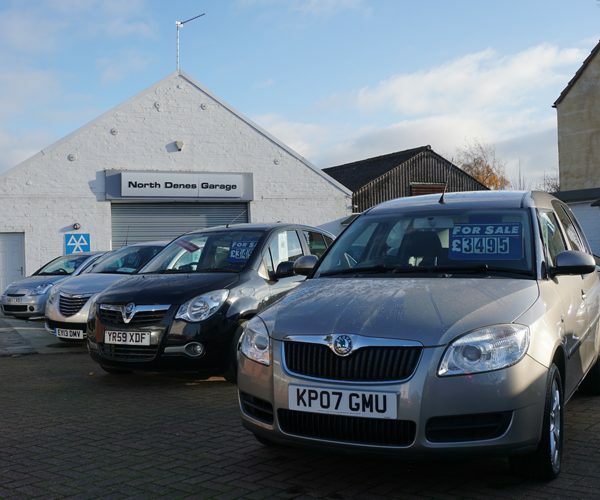 The used car sales at the garage have increased greatly in recent years with customers appreciating the excellent quality and value of the vehicles offered for sale. And with modern technology and the “World Wide Web,” North Denes Garage finds that it is appealing to an even greater spectrum of customers with many of whom travel from far and wide. Many of our staff have been with us a long time and we regularly invest in training apprentices and investing in our staff to ensure we have the technical knowledge required to service and maintain the modern motor vehicle. Our reception staff are industry competent and can help and advise in many if not all aspects of vehicles whether it be the specification, servicing or sourcing a certain model in a must-have colour for purchase we are happy to help. Customers can now view stock vehicles offered for sale in our “virtual showroom”, book services, M.O.T. Tests and general enquiries all 24/7 via our website. But you can also call 01493-842259 and talk to real people or call in at the garage and see us in person. We look forward to meeting you and helping you with your motoring needs by whatever means of contact you prefer.